A Japanese soldier reveals his second and third degree burns for American investigators. Photographed 79 days after the atomic attack on Hiroshima, this man was caught in the open 2,970 feet (900 meters) from the epicenter. These burns are developing into keloidial scars. Keloid tumors (derived from the Greek chele - "crab's claw") expand beyond the original wound. On December 23, 1946, Doctor Masao Tsuzuki (1893-April 5, 1961), formerly Admiral Tsuzuki of the Imperial Japanese Navy and the Japanese doctor in charge of studying the atomic bomb's effects starting a few days after the attack, claimed that keloids were the greatest problem for hibakusha (explosion-affected people). Caused by the thermal effects of the bomb and not radiation, keloids affected 60% of hibakusha. Many survivors were shunned by a Japanese public socially unaccustomed to disfigurements. Plastic surgery for keloids was attempted, but often the keloids returned. 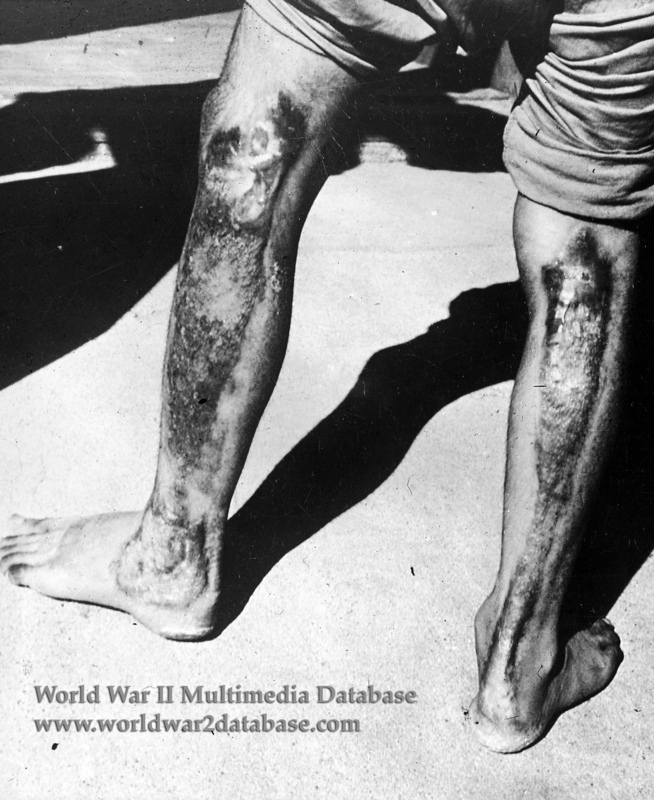 The lack of medical care after the attack prevented most hibakusha from receiving even the rudimentary burn treatment available in Japan at the time.